Apparently, some Alexa-enabled devices have started laughing in a disturbing manner at their owners. 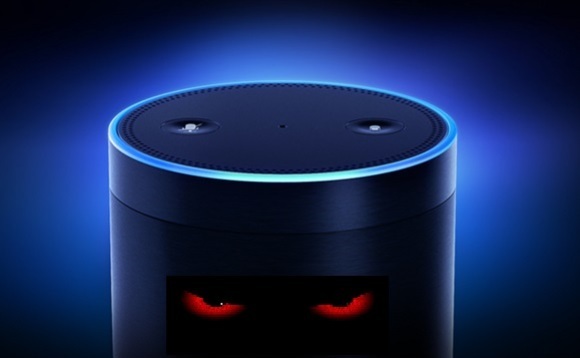 There have been reports made of unrequested creepy chortles issuing from smart speakers and Amazon devices by a number of users, who cannot understand why their personal assistant has suddenly become so sinister. Amazon is currently working on a fix for this disquieting issue. The general public has embraced intelligent personal assistants and smart devices into their homes. These virtual reality companions and their related technology help with simple tasks, answer straightforward inquiries, offer jokes and weather updates, and they soothe us by playing our favorite music. What they are not supposed to do is terrify their customers. So imagine trying to sleep in a dark, quiet room with an Alexa-enabled smart device in it, just to have the popular voice service suddenly interrupt your slumber with a nightmarish evil laugh. Alexa is actually programmed to laugh when requested to, but the personal assistant’s giggle is more endearing than perturbing. There have been quite a few suggestions as to what could be causing the horrifying hysterics: Could it be a software malfunction? Or could it be people playing pranks by manipulating Alexa’s telecommunications features? Or has a disgruntled Amazon employee decided to take over the world by inserting advanced AI into the Echo devices turning Alexa into a ghoulishly guffawing James Bond villain? For those yet to experience the unexplained laughter, either be prepared to be randomly freaked out at some point or perhaps consider disconnecting any devices that use Alexa until Amazon explains what is causing this petrifying phenomenon. There is even speculation that the malevolent cackle could be part of a viral ad campaign for something horror-related, although this would likely result in considerable controversy if true.